Fuku-Go is combination of Kumite and Kata, determined by Technical Committee of Fudokan Organization - called Fudokan Ki-tei. Technical Committee has a duty to prepare new Fudokan Ki-tei every two years according to the World Championship cycle. In memory of Sensei Nishiyama, kata Ki-tei made by Sensei Nishiyama will be obligatory in semi finals of Fuku-Go discipline. Kumite Matches: Use Kumite Competition Area (See Appendix). Ki-tei Matches: Use Kata Competition Area rules, adding two more competitors position spaces (1.5 m to the left and right of the present rear central position) and five chairs for Judges. Use Kumite Rules. The Repechage system can be used according to the protocol of competition. Each elimination alternates between Kumite and Fudokan Ki-tei competition. Final match is Kumite, Semi-final match is Ki-tei by Hidetaka Nishiyama, Third place match is Kumite. Use Kumite Rules or Ko-go Kumite Rules as in individual matches other than specified here. In case of a tie score, the winner is decided upon by Tsu-mae. Technical committee of Fudokan Federation will announce a new Ki-tei (name - Kitei Higashiyama Sensei) after each World Fudokan Championship. The new Fudokan Ki-tei Higashiyama Sensei will be performed – used up to the next Championship. The two competitors take their starting positions at the same time; one Aka (red - left side facing Main Seating), one Shiro (white - right side facing Main Seating). Then bow to the Shu-shin, bow to each other, and then again face Shu-shin. Aka side competitors must wear red belts. The Shu-shin indicates "Hajime" (start), and both start the Ki-tei. At the end of the Ki-tei demonstration, competitors, after bowing to each other and then to Shu-shin, shall await the Judges' decision from the finishing position, facing the Shu-shin in Shizen-tai. Shu-shin confirms penalty points and, if penalty confirmed, calls Court Judges meeting to decide penalty points. After Han-soku or penalty confirmed, the Judges calculate the scores on the Ki-tei Scoring Forms. After the Court Judges calculate the final score, they must indicate either Aka or Shiro side winner. Then the Shu-shin makes one long and one short whistle blow; at the same time, the Shu-shin and the Fuku-shin raise the winning side's flag (Aka or Shiro). Shu-shin counts the Judges' Flags and determines Aka or Shiro winner by majority. Shu-shin blows whistle and Judges lower their Flags. Shu-shin raises winner's Flag (Aka or Shiro), then declares winner. The competitors bow to the Shu-shin, then to each other. They then leave the Competition Area. Recorder(s) collect Court Judges' Scoring Forms. After the winner is declared by the Shu-shin, the Announcer announces the winner's name, but no score is given. After the end of the match, the Recorder immediately checks the Court Judges' Scoring Forms. In case a scoring form does not match the Judge's Flag (Aka or Shiro), report the error to the Shu- shin, and then announce the correct Winner. The announcement of the change in the winner's name must be made before the next round begins. Mistake in sequence, including misplacement of “Ki-tei” - 0.2 each instance. Skipping technique, including omission of “Ki-tei” - 0.2 each instance. Competitor does not demonstrate Ki-tei. Winners of Ki-tei participate in next round of Kumite, and then those winners compete in Ki-tei (alternate). 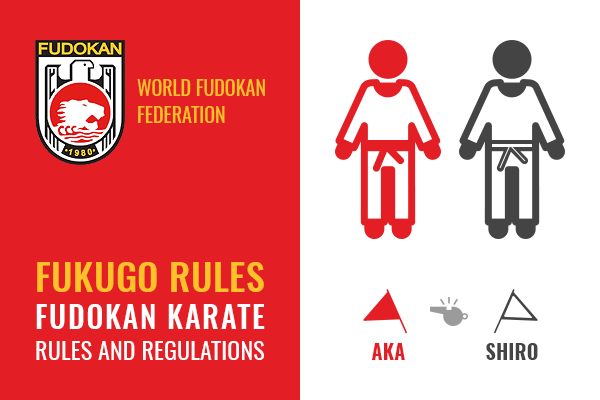 Regulamentul de karate "FUKUGO RULES - International Fudokan Karate Rules and Regulations" by World Fudokan Federation, publicat in 2012, poate fi vizualizat sau descarcat si in format PDF accesand acest link. The Karate Fudokan FUKUGO Rules according to World Fudokan Federation can be viewed as PDF accessing this link or you can order the book from World Fudokan Federation Shop.